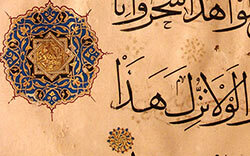 In contrast to discussions that describe or explain Islamicate calligraphy in terms of religious principles or abstract theories of aesthetics, this site aims to draw attention to Islamicate calligraphy as both a highly artistic medium of communication and a craft. 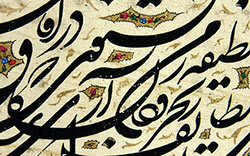 For this reason, the site focuses on exemplary works of individual artists rather than on “Islamic” or “Iranian calligraphy” in general. 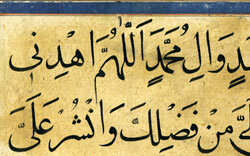 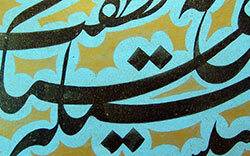 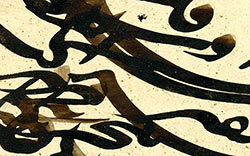 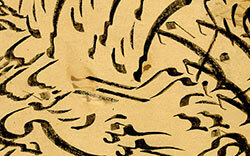 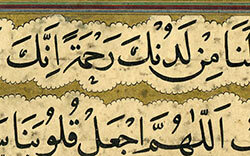 Furthermore, it introduces viewers to the technical vocabulary and artistic techniques related to the production of calligraphy, with the aim of helping viewers develop a visual vocabulary through which they could arrive at their own conclusions about the aesthetics of Islamicate calligraphy. 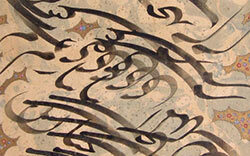 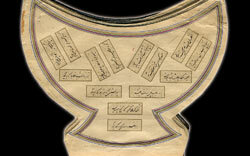 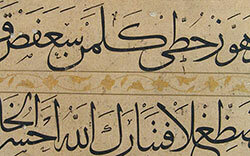 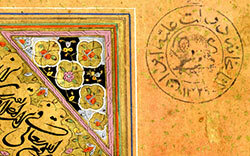 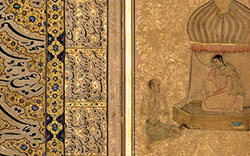 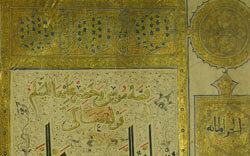 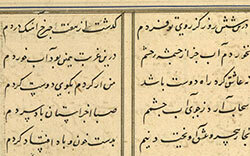 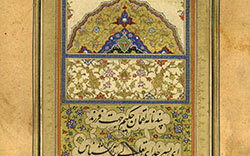 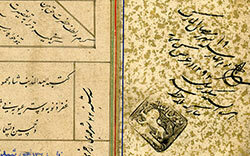 In this way, priority is granted not to the historical development of Islamicate calligraphy, but to casting light upon the intricacies of the particular artistic figures and techniques that brought it forth in the context of greater Iran. 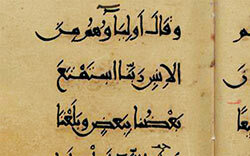 Students of Islamicate calligraphy may be surprised that this anthology does not begin with Ibn Muqla (d. 940), who is generally regarded as the inventor of the curved Arabic script, but of whose work no examples remain. 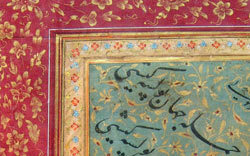 Given our aim to create a platform for interaction with works of individual calligraphers, we decided not to begin our anthology with Ibn Muqla despite his seminal place in the history of this art form. 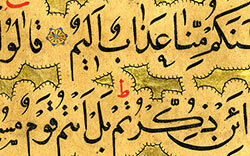 Rather, we begin with another famous artist, Ebn Bavvāb (d. 1022 CE), and a little known but outstanding master calligrapher and artist, ‘Osmān b. al-Hosayn al-Ghaznavi (d. after 1091), who scribed and illuminated the earliest known copy of the Qur’an with interlinear Persian translations. 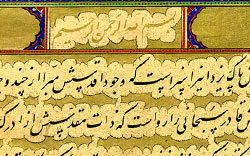 In annotating each work of calligraphy we had to balance providing enough information for viewers to develop their own analytical eye and artistic vocabularies against being overly redundant in our annotations. 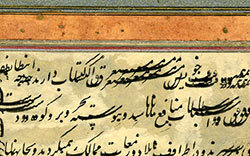 We have thus highlighted the elements that are most significant and discernable in each of the annotated works. 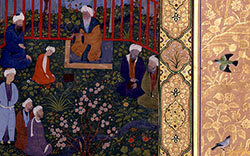 Several artistic motifs appear across multiple images, though we have not highlighted them in every instance with the hope of encouraging viewers to explore and interact more deeply with the site and its works. 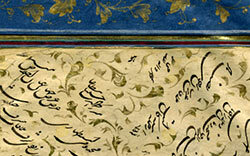 While we have completed our selection of the works that will be included in the anthology, other parts of the website remain under development. 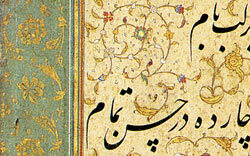 Currently, with the exception of the works of Mir ‘Emād and ‘Ali-Rezā ‘Abbāsi, only the first piece by each of the calligraphers is annotated. 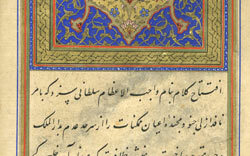 In its final form, all of the pieces on the site will be annotated and cross-referenced, and there will be translations and transliterations as well as critical descriptions of all of the works anthologized.